This week on the show it’s our esteemed pleasure to welcome the Radio Repertory Company of America (RRCA) who have produced dozens of works in the past 15+ years including the esteemed Anne Manx series featuring Claudia Christian (of Babylon 5 fame). 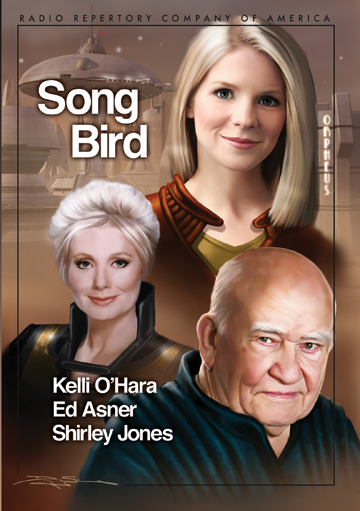 Tonight we feature the 1st 1/2 of their new show, “Song Bird.” Song Bird tells the story of Maureen Barnett (played by three time Tony nominee Kelli O’Hara), once a singer renowned the world over. Now though, things couldn’t get much worse. She’s stuck performing in dives, her daughter hates her, and she’s recovering from a severe nervous breakdown that leaves her petrified in front of large crowds. Prospects couldn’t look bleaker, when in walks Amelia Storm (Academy Award winner Shirley Jones), an aging chanteuse, offering Maureen the ability to see into the future. Maureen reluctantly accepts and finds herself haunted by visions of something dreadful happening to her daughter Holly, who is soon abducted and held for ransom. You can hear the rest of this show on RRCA’s website, also check out the RRCA Facebook page for news on their latest shows. Enlisting the aid of a freshly retired policeman turned private eye named Henry Powell (Emmy winner Ed Asner), Maureen goes on a dangerous journey to get her daughter – and her confidence – back at all costs. First up, a dose of The Cleansed, with the inaugural chapter of our newest Episode 4 – The Pig Man, followed by a pitch for our upcoming Radio Drama Revival app. Have you taken our listener survey? Radio Drama Revival is a bi-weekly podcast featuring the best of contemporary audio drama (work produced after the golden age of radio). We also occasionally dabble in exploring earlier audio works from a cultural/historical perspective. Broadcast and podcast since 2007, we have over 450 hours of original, contemporary audio fiction here for your listening pleasure. Dig into the latest show or surf the archives. Learn more about Radio Drama Revival and our hosts. Donations of any size appreciated! Become a Patron!